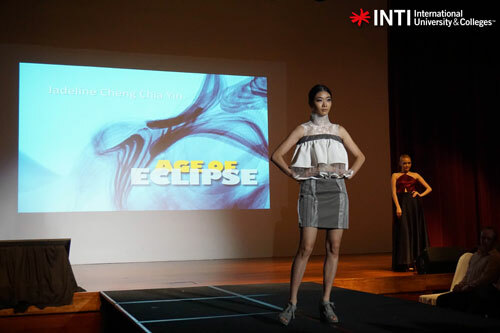 Shades of darkness and light characterised the ritzy creations of INTI Centre of Art & Design (ICAD)’s fashion design students marking their graduation with a spectacular ‘Age of Eclipse’ fashion show. 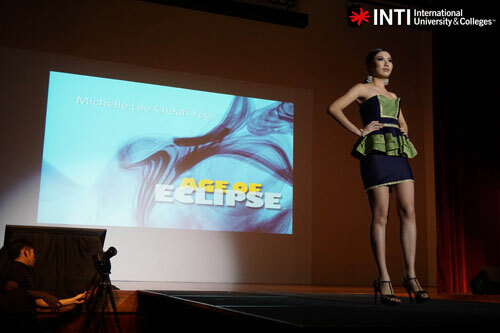 One of Michelle Lee Cheah Yee’s mesmerising designs. Applying a contrast of colours with fabrics dark and bright, 10 young designers, including STYLO 2014 finalist Andrew Khoo Ming Shen, showcased their unique collection of over 40 stunning avant-garde designs inspired by imagery of celestial events, in particular solar and lunar eclipses. Their aesthetic collection, complete with matching headgear and footwear, consisted of dresses and attires that were luxurious, elegant and sensual all at once. The fluidity of colours and styles mirrored the mystical theme of the event. Guided by a dedicated team of highly qualified and experienced fashion instructors, ICAD’s young graduates are fast becoming the next generation of trend setters and designers in the fashion industry. Two stunning attires by Jadeline Cheng Chia Yin. Drawing upon a potent combination of technical knowhow, imagination and creative flair, they have bagged numerous coveted awards in the local and international fashion scene and drawn the attention of fashion icons and personalities such as Bon Zainal, Cris Yong and Nelissa Hilman who lent their support at the fashion show. ICAD students’ international exposure, innovative learning and individual development are enhanced through participation in many competitions, industry projects, international study trips (for example, to India, South Korea and Hong Kong), and practical training with established local and foreign labels. A good example is Hariharan Arasu, winner of Kronenbourg 1664 L’Aperitif Fashion 2012 and a recent graduate. Hariharan enjoyed a week-long internship with Dato’ Jimmy Choo in London, which also gave him access to the London Fashion Week and designers for the Ossie Clark London label. Empowered with the ability to apply their talent and artistic techniques in the creative process, and express their ideas in their own distinctive style, ICAD’s graduates can look forward to becoming versatile, adaptable and enterprising professionals that are always on top of the latest trends. Formerly known as PJ College of Art & Design, ICAD draws on an established legacy of creative excellence to offer foundation, certificate, diploma and degree programmes in art & design. Specialisations include Interior Design, Graphic Design, Fashion Design, and Interactive Multimedia & Animation Design. Its degree programmes are offered in collaboration with the UK’s Sheffield Institute of Arts, Sheffield Hallam University.